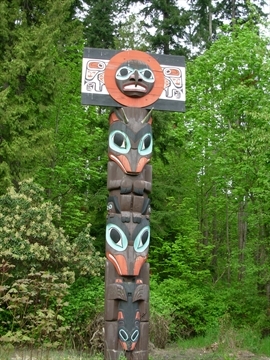 The First Nations Totem Poles in Stanley Park in Vancouver, British Columbia are the most visited attraction in Vancouver, British Columbia, and possibly all of Canada! 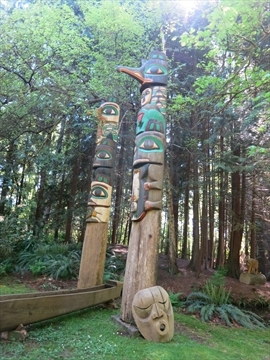 There are a number of beautiful totem poles in Stanley Park at 2 different locations within the park. 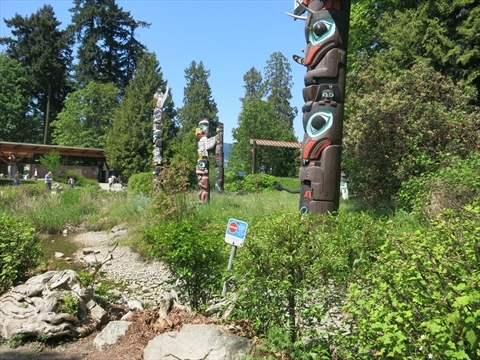 All but 3 of the totem poles along with 3 Welcome Gateways are located in a beautiful meadow setting at Brockton Point in Stanley Park. 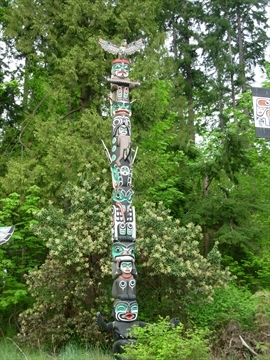 There is one totem pole, Children of the World at Stanley Park Junction where the Miniature Train operates. 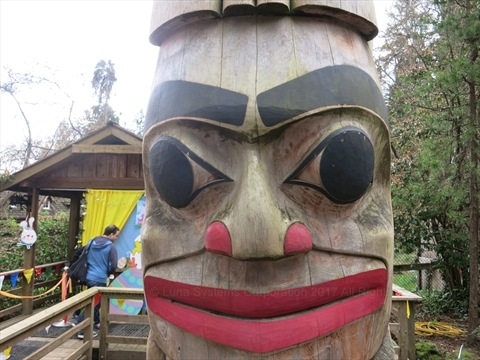 Additionally, there are 2 other totem poles that are on the Minature Train route that can only be seen by taking the train ride during the day. 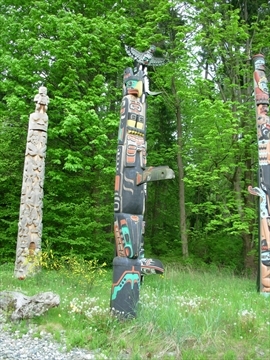 The collection of totem poles in Stanley Park started in the 1920s when the Vancouver Parks Board started buying them thinking that they would eventually build a replica First Nations village in Stanley Park. Some of these original totem poles were carved as early as the 1880s. They were originally located at Lumbermens' Arch and at Prospect Point. In 1962, they were moved to Brockton Point where they now reside. There are stories that there are parts of some old totem poles in the bush behind the hill where the totem poles used to be at Lumbermens' Arch, but we looked and didn't see any!. 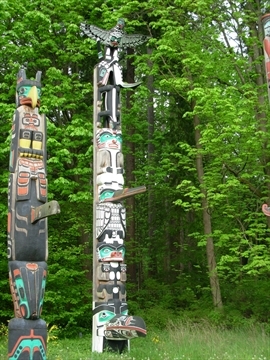 By the mid-1980s, many of the totem poles in Stanley Park were damaged and rotting. Then, some of the damaged poles were put into museums and replicas carved. 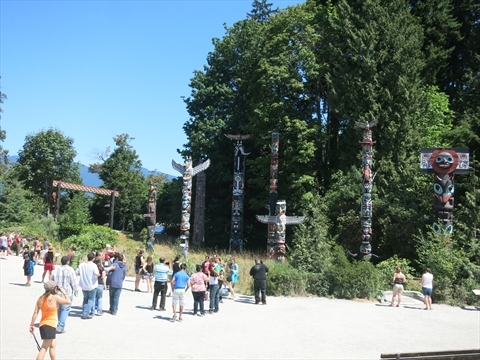 The totem poles were also put into a separated grassy area where the public was not permitted to walk. This is where they reside now. Although, they somewhat continue to deteriorate because of the weather. We even see moss growing out of some of them! 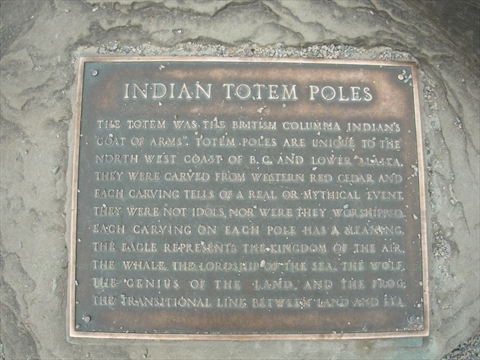 The Totem was the British Columbia Indians's coat of arms. 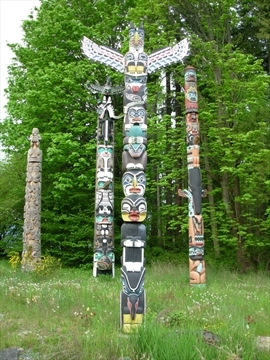 Totem poles are unique to the north west coast of B.C. and lower Alaska. They were carved from western red cedar and each carving tells of a real or mythical event. They were not idols nor were the worshipped. Each carving on each pole has a meaning. The eagle represents the kingdom of the air. The whale the lordship of the sea. The wolf, the genius of the land, and the frog, the transitional link between land and sea. 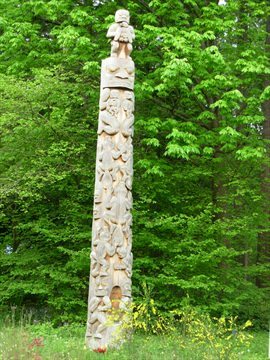 The Rose Cole Yelton Memorial Totem Pole is the first totem pole you see when you enter the area in Stanley Park with totem poles. The honours her, the last surviving resident of the Brockton community, and all those who lived in Stanley Park. more detailed information and photos.. 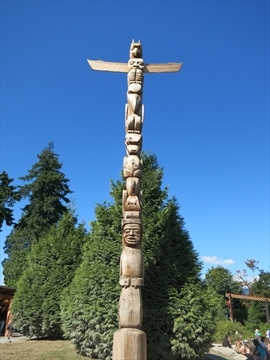 The Children of the World Totem Pole is located in the plaza at Stanley Park Junction. This totem pole is free to view. There are 2 totem poles that are on the minature train ride route. You can only see these 2 totem poles if you take the minature train ride during the day. The miniature train ride is a paid attraction. 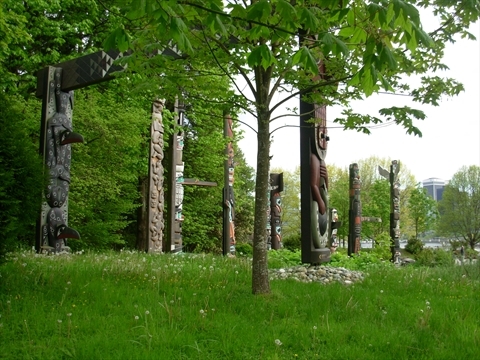 All, but 3 of the totem poles in Stanley Park reside in an area next to the playing fields at Brockton Point. 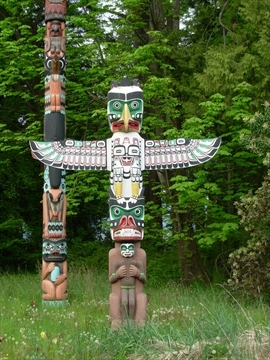 The Children of the World Totem Pole resides at Stanley Park Junction. Two additional totem poles are on the Minitature Train route and are only viewable if you ride the train during the day. 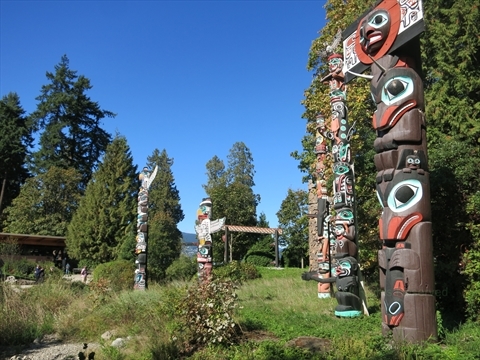 How can I get to the Totem Poles in Stanley Park? 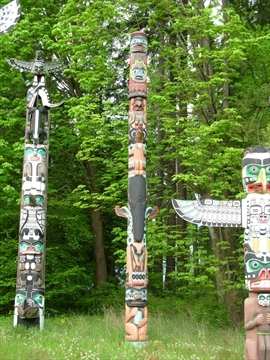 You can get to the Totem Poles in Stanley Park by walking, by bicycle, by car, or on a tour. 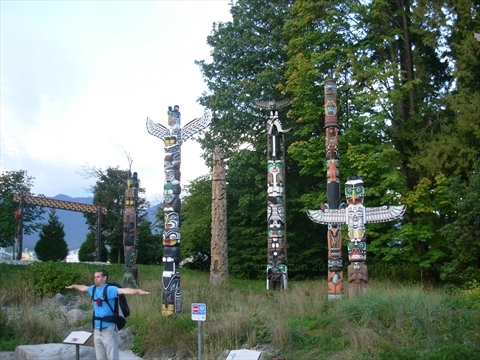 The Totem Poles are about a 20 minute walk on the seawall from the Coal Harbour entrance to Stanley Park. The seawall is flat so this is an easy, but fairly long walk. You can bicycle to the Totem Poles. It is about a 10 minute bicycle ride on the Stanley Park Seawall from the Coal Harbour entrance to Stanley Park to the Totem Poles. The one issue with bicycles is that the seawall is one-way so to get back to the city, you will either need to walk your bicycle back to the city, or go all the way around Stanley Park on the seawall (about 1 hour), or ride cross-county across the park back to the city! 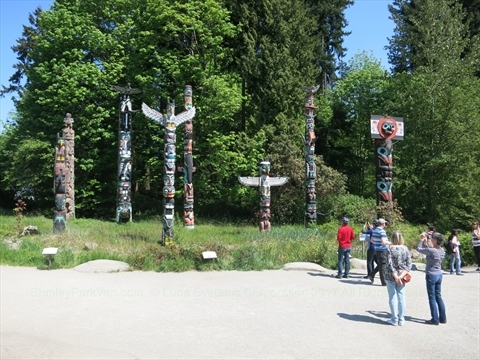 You can drive to the Totem Poles via Stanley Park Drive. There is limited pay Parking at the Totem Poles. You may have to drive farther around the park to find a parking space. You may have to drive around Brockton Point and back past the Totem Poles on the north side to the Brockton Oval parking lot. 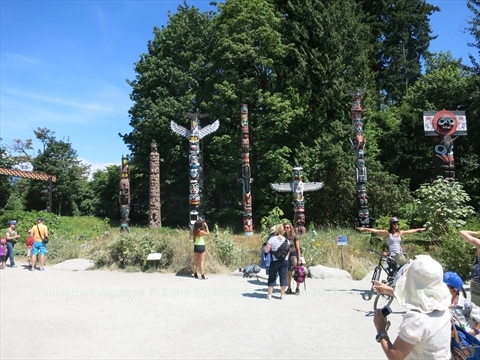 A number of tours stop at the Totem Poles. The Horse-drawn Carriage Tour stops for about 5 minutes at the Totem Poles. The seasonal Stanley Park Shuttle stops in front of the Totem Poles so you can hop off for as long as you want, then hop back on. Finally, a number of city bus tours stop at the Totem Poles.